Originally from Vancouver (CA), Kodama has been based in Belgium since 2008, where she graduated from the Higher Institute of Fine Art (HISK), a post-graduate program in Ghent. She has an MFA from the Frank Mohr Institute in Groningen (NL) and a BFA from ArtEZ Institute of the Arts in Enschede (NL). Kodama’s first general residency project was to create paper landscapes in different scales, textures and colours while trying to explore the relationship between physical and mental landscapes. 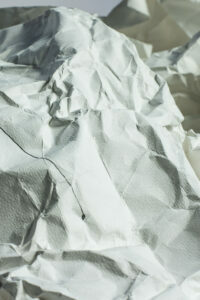 The paper landscapes are in dialogued with her imagination, as seeing them take shape (as mountains, canyons, and valleys) helps her imagine ways to hike through or fly over them. These journeys crossing mountains and hights inform the stories she develops. This method should give the opportunity to create her writing about landscapes and to manually work with different materials. 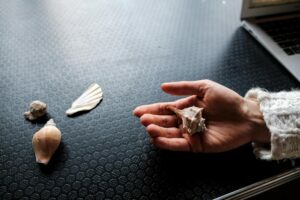 However, as things are always fluctuating, Kodama has chosen to elaborate a new project revolving around a sand dollar – a project similar to the existing performance It seemed far, but it was close which will be presented during the art festival Same Same But Different. Stories can take many forms and I make use of their mutable nature through a multidisciplinary practice in-cluding video, photography, drawing, writing, and performance. My work focuses on the every day like the short stories of Raymond Carver, who writes about daily struggles with a minimalism that emphasizes brevity and inten-sity. Similarly, I attempt to be precise about the commonplace in a way that sheds new light on familiar objects and situations. My work is biographical on the surface, but the initial sense of familiarity is often undermined by gaps in the narrative that leave one with a feeling of alienation. The discrepancy between different parts of my stories evokes the ambiguity of situations in daily life and the discomfort of facing conflicting thoughts.One of my central interests is the relationship between the visible, hidden, and invisible because our experiences are a combination of the three. I aim to acknowledge the hidden and the invisible by mapping them in relation to what can be seen. Doing so is a way to be curious, ask questions, and imagine possibilities. I challenge fixed methods of looking by arousing uncertainty about what is being perceived. Through layering images, texts and sounds that are in some way dissonant, I establish a story that isn’t completely coherent. Gaps appear within the plot, which become fault lines that trace counter-narratives. What is stated in the story delineates the unstated so that the negative spaces oscillate with the positive. Storytelling within a setting I created eventually grew naturally to me. I began installing narrative videos in loop, but people never fully took in the film’s content or watched it for its full duration. Experiencing the whole story felt like a fundamental part of my practice. In what ways could I increase my physical presence or augment audience engagement? Drawing on the reciprocal energy between the public and me improved their active experience, and their involvement guided me to creating performances with intimate settings built by gathering all kinds of coincidental, spatial elements. Go in and out of reality. I let the public choose to switch between different truths and realities and allow them to gain from understanding that duality. Playing with site-specific contexts and manipulating your sense of time and light improve the transcendental quality of the mental journey. I want them to be able to comfortably travel in the right circumstances enhanced by using the right backgrounds and by giving them space to associate things on their terms. We all carry with us personal associations and valuable experiences, and I direct you to use at least one of them. In that way, the audience and me interact on a mental, imaginative level. Reinvigorating your imagination is essential in order to travel and surpass reality. At first, I used settings to achieve your mental journey. For example, a canvas manufactory gave me the chance to play with lighting and offered the audience multiple opportunities to step in- and outside stories and frames. Recently I prefer objects and their substantial nature. In my stories I subtly encourage you to picture them as something more than the material. It can be a house, a tree, a person… However, I do choose the associations carefully. I’m currently creating a narrative for a sand dollar, something similar to a real-life film experience, as if you’re flying around the object. A sand dollar is a flattened, burrowing species belonging to the order of the sea urchins. 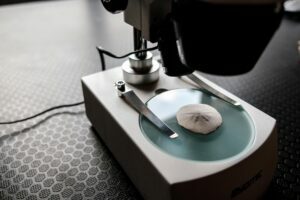 This natural sea creature or biscuit lookalike is put under a microscope and gently rotates on a machine programmed by the other half of this project, Elias Heuninck. You look through the microscope. You have a general idea of how that sand dollar looks in its actual size, but no clue how things evolve on a more miniscule level. Your perceptions change, slowly. The structured pattern resembling that of a flower, a starfish or a beautiful homemade cookie becomes more tangible, more rugged and uneven. The surface adopts a sandy disguise gradually transforming into snow when you stare a little longer while listening to the story. It makes you appreciate the object differently, identify certain aspects which weren’t striking at first and ascribe a singularity to it. The narrative and the unfolding of the unusual landscape benefit from their intercommunication. Some tiny holes echo footsteps in snow. Some holes are dirty and surrounded by yellowish specks which look like dusty snow, the others resemble clean and white sand like on Hawaiian beaches. Everything can become many things, as long as you allow your imagination to look beyond its current reality. A true sense of scale and understanding of objects.